A widespread traditional perception is that the Japanese manufacturing sector has strong forward linkages in global value chains (GVCs), i.e. Japanese firms’ value added accounts for an important share of foreign final demand and Japanese firms therefore benefit substantially from foreign final demand (e.g. OECD 2018). However, recent trade and other statistics imply that some industries in Japan’s manufacturing sector, such as electric machinery, have been losing competitiveness and forward linkages may be weakening. In this column, we present and discuss evidence on these trends based on a new study we recently completed (Ito et al. 2017). The role of GVCs has recently become an important topic due to the increased fragmentation of production across countries and industries. Multi-country input-output tables (MIOTs) have been extensively used to measure the significance of GVCs (e.g. Koopman et al. 2014). Several initiatives, such as the joint initiative by the OECD and the WTO on Measuring Trade in Value Added (TiVA) (Piacentini and Fortanier 2015) and the World Input-Output Database initiated at the University of Groningen within the framework of a European Commission project, have attempted to construct such tables (Timmer et al. 2015). The idea underlying these databases is to link national supply-use tables via international trade flows. Both theoretical and empirical research suggests that there is considerable heterogeneity across firms and their export activities within the same industry (Melitz 2003, Bernard et al. 2007), and recent studies using MIOTs have sought to incorporate such heterogeneity by splitting industries into groups of firms in terms of their size, ownership, trade mode, and so on (Ahmad et al. 2013, Ma et al.2014, Fetzer and Strassner 2015). However, there are few such studies focusing on Japan, even though neglecting such heterogeneity may produce biased results in analyses relying on MIOTs. Our study attempts to fill this gap using a unique Japanese manufacturing plant-level dataset. Specifically, using matched data from the Economic Census for Business Activity and the Basic Survey on Wage Structure, we split output in 16 industries of Japan’s manufacturing sector in the OECD Inter-Country Input-Output (ICIO) table into output for exports and domestic sales to reflect heterogeneity across firms. Thus, input-output transactions are divided into production for exports and production for domestic sales for each of these 16 industries. To examine the GVC participation of Japanese manufacturing plants, we compute TiVA indicators related to forward linkages1 and backward linkages2 from our extended ICIO table, and compare them to indicators computed from the original OECD ICIO table. 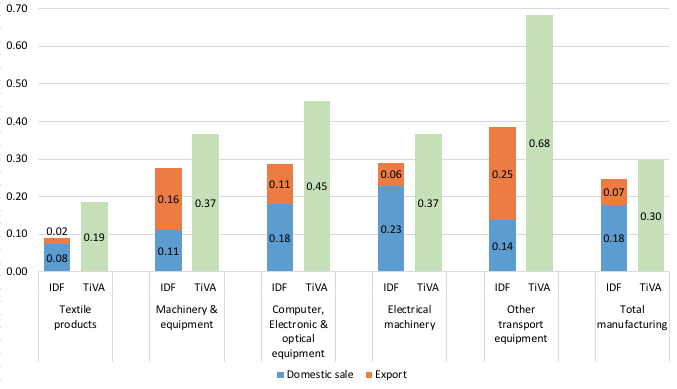 Figure 1 shows the share of domestic value added (DVA) in Japan’s exports as well as the foreign value added (FVA) in Japan’s exports, in our estimates (denoted by ‘IDF’) and the corresponding OECD TiVA statistics (denoted by ‘TiVA’) for the manufacturing sector overall and several industries in 2011.3 We find that the domestic value added computed from our split ICIO table is lower in the industries shown than the domestic value added computed from the original ICIO table.4 The lower domestic value added in our estimates means that the foreign value added is higher than in the original ICIO table. Another indicator of forward linkages in GVCs is the domestic value added embodied in world final demand. 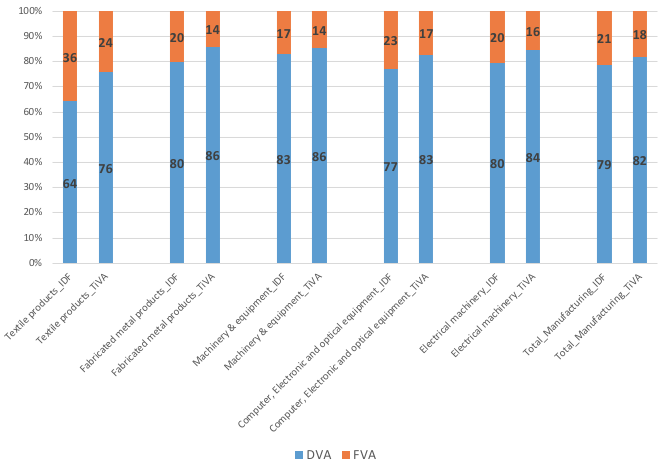 Figure 2 compares our estimates with those reported in the TiVA database, and shows that our results are lower than the TiVA results for the industries shown and the manufacturing sector overall.5 Note that companies in these industries tend to rely on outsourcing as well as outward foreign direct investment (FDI) and intra-industry trade. Thus, when we consider manufacturing plant heterogeneity in production for exports and production for domestic sales, we find that both the domestic value added in Japan’s export and the domestic value added embodied in foreign final demand are lower than the results based on the ICIO table, not taking such heterogeneity into account. Why are our estimates lower than the TiVA estimates? The reason is that our split ICIO table distinguishes between Japan’s production for exports and production for the domestic market, and therefore reflects more accurately the actual situation of Japanese firms’ internationalisation – namely, the fact that only a limited number of firms with high productivity are engaged in international activities. That is, while Japan is widely perceived as a country with highly competitive manufacturing firms with substantial forward linkages, only a relatively small number of firms are actually engaged in export activities to satisfy foreign final demand, and, of the firms engaged in international activities to meet foreign final demand, many generate part of the value added abroad through FDI, intra-firm trade, offshoring, and so on (i.e. value added induced by foreign final demand leaks to other countries). On the other hand, the large majority of firms in Japan conduct transactions only with domestic firms. The input-output structure of production for export is quite different from that of production for domestic sale. Thus, the indicators of forward linkages estimated from our split input-output table based on firm-level data reflecting these differences are lower than the original TiVA indicators. It is likely that firms engaged in international activities are more capital-intensive and skill-intensive than firms not engaged in international activities. To examine whether this is indeed the case, we calculate factor inputs embodied in world final demand in production for exports and production for domestic sales using our split ICIO table. The results, shown in Figure 3, indicate the following. First, we find that production for domestic sales makes up a relatively large portion of Japanese factor inputs embodied in world final demand, meaning that a substantial part of production for domestic sales is used as inputs for production for export. Thus, production for domestic sales benefits from foreign final demand via indirect linkages. 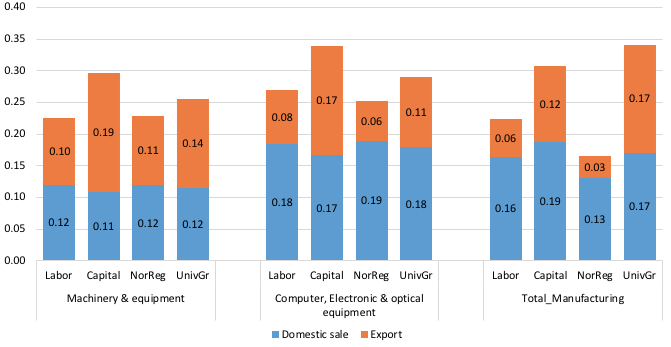 Second, the input of capital and high-skilled labour (university graduates) in production for domestic sales is higher than in production for exports in the computer, electronic, and optimal equipment industry and in the manufacturing sector overall (about the same for university graduates). In fact, we obtain this result for most industries in our study. Thus, we conclude that in the case of Japan the input of capital and high-skilled labour in production for domestic sales benefits more from foreign final demand than in production for exports. Third, capital and high-skilled labour are embodied in foreign final demand to a higher extent than labour of regular and non-regular workers (indicated as “Labor” and “NonReg”) in the industries shown in Figure 3. Again, we obtain this result for most industries in our study. Thus, we conclude that capital and high-skilled labour benefit to a higher extent from exports and foreign final demand than less-skilled labour (regular and non-regular workers). Notes: 1. The figures represent the ratio of factor inputs embodied in world final demand to the total factor inputs of the Japanese manufacturing sector or specific industries. Due to factor inputs embodied in domestic demand, the sum of “labor” and “capital” is equal to 1 minus the ratio of factor inputs embodied in domestic demand to the total factor inputs. The estimates for labour and capital are based on ECBA microdata. 2. “NonReg” and “UnivGr” stand for non-regular workers and university graduates, respectively. The estimates for NonReg and UnivGr are based on matched ECBA-BSWS employer-employee data. 3. Based on matched employer-employee data, the share of non-regular workers in total workers in the manufacturing sector overall is 25%, while the share of university graduates is 19%. In sum, we find that in most industries’ forward linkages are capital and skilled-labour intensive. Thus, we would expect an increase in foreign demand to induce a higher increase in demand for capital and high-skilled workers than for less-skilled workers. Our findings based on Japanese firm-level data suggest that considering production for exports and production for domestic sales may provide a more complete and better picture of firm heterogeneity within industries in ICIO tables. Moreover, as we document for the case of Japan, the resulting TiVA indicators present a more complete picture of the interconnected countries through backward and forward linkages in global value chains. Ahmad, N, S Araujo, A Lo Turco, and D Maggioni (2013), “Using Trade Microdata to Improve Trade in Value Added Measures: Proof of Concept Using Turkish Data”, in A Mattoo, Z Wang, and S-J Wei (eds. ), Trade in Value Added: Developing New Measures of Cross-Border Trade, Ch.8, 187–219. Bernard, A B, J Bradford Jensen, S J Redding, and PK Schott (2007), “Firms in International Trade,” Journal of Economic Perspectives, 21(3): 105-130 . Fetzer, J, and E H Strassner (2015), “Identifying Heterogeneity in the Production Components of Globally Engaged Business Enterprises in the United States,” US Department of Commerce, Bureau of Economic Analysis Working Paper, 2015-13. Ito, K, I Deseatnicov, and K Fukao (2017) “Japanese Plants’ Heterogeneity in Sales, Factor Inputs, and Participation in Global Value Chains,” RIETI Discussion Paper 17-E-117. Koopman, R, Z Wang, and S-J Wei (2014), “Tracing Value-Added and Double Counting in Gross Exports,” American Economic Review, 104 (2), 459–494. Ma, H, Z Wang, and K Zhu (2015), “Domestic Content in China’s Exports and its Distribution by Firm Ownership,” Journal of Comparative Economics, 43(1): 3–18. Melitz, MJ (2003) “The Impact of Trade on IntraIndustry Reallocations and Aggregate Industry Productivity,” Econometrica, 71(6):1695–1725. OECD (2018), “Domestic value added in gross exports”, data indicator. Piacentini, M, and F Fortanier (2015) “Firm Heterogeneity and Trade in Value Added,” STD/CSSP/WPTGS (2015)231, OECD Publishing. Timmer, MP, E Dietzenbacher, B Los, R Stehrer, and GJ de Vries (2015) “An Illustrated User Guide to the World Input–Output Database: The Case of Global Automotive Production,” Review of International Economics, 23:575–605. Forward linkages are production activities in Japan to meet overseas demand. Specifically, they are measured by two indicators: the domestic value added in Japanese manufacturing sector exports, and the ratio of domestic value added embodied in world final demand to the total value added of the Japanese manufacturing sector. Backward linkages are production activities abroad used in the production of Japanese exports. Specifically, backward linkages are measured as the foreign value added in Japanese manufacturing sector export. DVA is an indicator of forward linkages, while FVA is an indicator of backward linkages. The sum of DVA and FVA equals 1. We document this fact for other industries as well in our study. Again, we document this fact for other industries as well in our study.